The Cromford & High Peak was a wonderful piece of railway, high in the Pennine hills. Originally conceived as a canal, it had long level sections interspersed with fearsome gradients, inclines and sharp curves. My early visits to the line were long before I had a camera, but I did manage several trips with a camera, including the final day of working on 30th April 1967. Here are a few pictures to start with, more to be added! Black & White photos are taken with a Voigtländer Perkeo I folding camera on Ilford HP3 film, colour photos with the Voigtländer Vito CLR 35mm camera on Agfa CT18 film. 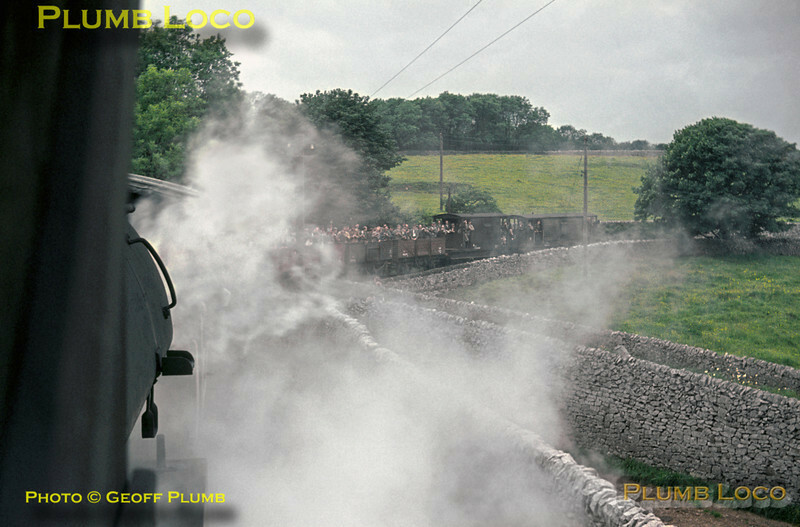 Seen from the footplate of 68012, the train negotiates the famous "Gotham Curve", at 2½ chains (55 yards) radius the sharpest curve on a British "main" line. This curve was the main reason for the use of short wheelbase engines and wagons, even so there was much squealing of flanges against the check rail as we rounded the curve. Saturday 27th June 1964. Slide No. 742.